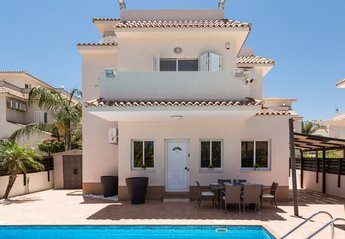 Four bedroom,front line villa with amazing sea views and plenty of outside space for sunbathing. Villa Alexa is perfectly located 2 minutes walk from the gorgeous beaches of Ayia Triada. Modern & Spacious 3 Bedroom Villa with Private Pool situation in a quiet residential area of Paralimni, just a stones throw to the beach. Four bedroom villa with swimming pool, 700 meters to Crystal Springs, Trinity, and other secluded beaches. Spacious brand new one 3 bedroom with private swimming pool within walking distance to local shops, supermarket, 700 m to the beach.